To access the files in Enterprise Server using Content Station, you need to log in to an instance of Enterprise Server. This is done by choosing a Server from the Server list in the Sign In window. When this list becomes very long, it may be difficult to find the Server that you want to log in to. To increase the readability of the list, separators can be added. The separators are added as a dummy Enterprise Server of which the name is used as the separator by using characters such as '=', '-', '_', and so on. 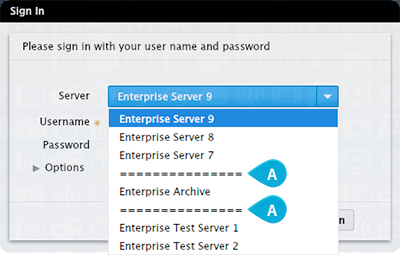 Create the separators by adding them to the list of Enterprise Servers.